Staircases may be all sorts sizes and arrangements (with or without landings etc) to suit different properties but the main parts which go up to make any stair case are fairly common. 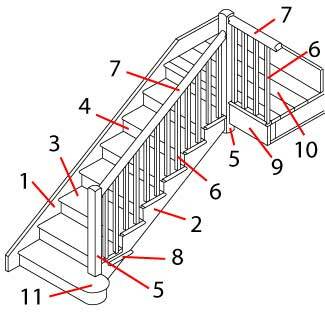 A typical staircase is illustrated below with the main parts identified with more detailed definitions of each below. The main features of staircases have not changed over the years, although the style has changed - the newel posts and balusters were often more ornate on older staircases, later balusters were sometimes covered by a solid in-fill (older staircases which were updated often had the balusters covered with hardboard, removing this may reveal the original balusters). The various parts for a staircase were traditionally made in a carpenter's workshop and then the staircase was built into the property as it was being built. Modern practice is for staircase parts (or complete simple staircases) to be mass produced so that the assembly on site is minimised. 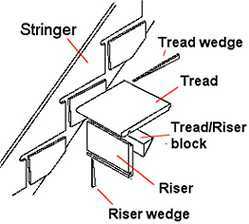 The traditional method (as right) for fixing the treads and risers to the stringers was to use wedges in slots in the stringers with the front of the treads and tops of the risers were secured to each other by glued blocks. Modern, mass produced staircases tend to use glued blocks between both the treads/stringers and the treads/risers. The vertical posts in the space under the banister to the treads or floor (on the side of a landing). The handrails up the side (or sides) of a stairway and, as an extension, along the edge of a landing. The bottom step of a staircase which curves around sideways beyond the side of the staircase. The vertical covering under the edge of an exposed landing which covers the gap between ceiling and floor. A decorative ornament used to decorate the top (and possibly the bottom) of a newel post - often in the shape of an ball, spike, urn, bun, or figure. The flat area of flooring where a stairway makes a turn between main floors. The side of a staircase set against a wall which locates the treads and risers. The flat area of flooring at the top and bottom of a staircase leading to rooms. The vertical post at the end or turn of a banister. The side of a staircase open to view which locates the treads and risers. The moulding, (normally half round) fixed to the ends of the treads exposed in a hallway and which covers where the balusters fit into the treads. The vertical part of a step. The, usually wooden, wedges used vertically underneath a staircase in slots cut into the strings to secure the risers. The, usually wooden, wedges used horizontal underneath a staircase in slots cut into the strings to secure the treads. The, usually wooden, blocks used by gluing to secure the front of the treads to the top of the risers at the front edge of each step.